These are a few photos which are courtesy of my daughter who spent the day with our Canadian visitor at the local Zoo feeding the animals (a special tour under Zoo Keeper supervision). I didn't have the courage to do this. I think I would have fainted at the point they gave me the horse and deer and rats to feed the animals....the food they eat scares me more than the big cats......you get the picture (so no gory dinner pics on the blog). However, the animals really look kind of cute from this safe distance..and are very well looked after. I love the shy Koala who refused to show his sweet face. Aussies aren't usually that timid. Click on the images to see a larger version (if you are game, of course). My personal favourite was this stylish creature (monkey). Who knew? Monkeys apparently have hair products. Your daughter looks the cuddliest of all Lilly! I get the picture with the food though. Zoos are like that - they're so close to reality. On the other hand, so far as I'm concerned they aren't close enough. RAW HORSE?! I'm with you. But the pictures are great! I love the animals, and your girl is fabulous!! those are the cutest darn animals! I love em all! in my other life I should be a zoo keeper...i so miss going to the zoo, baldyman cant take it, I guess I need to add that to my list of goals in 2009 and go even if its alone! These are gorgeous pictures, but I can't believe they let your daughter that close to a leopard?? She's brave. Good morning, Lilly. The pictures are AMAzing! wow! I love the giraffe one the most. :) So glad she had a good time. Very nice pictures, Lilly! The picture of the giraffe is my favorite. Your daughter is beautiful. 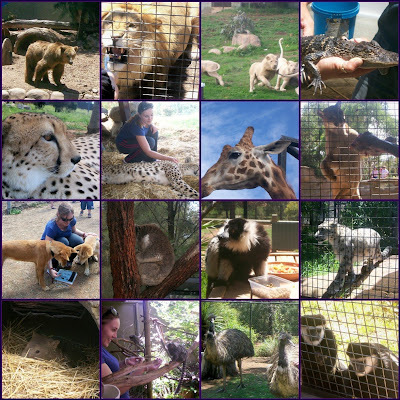 Looks like a great zoo (I love zoos, except for the animals in captivity part, lol)). And looks like a great time, as well. But, I don't blame you for not wanting to witness the feedings, they can be a little too real for some. Wow! That is so cool! Are you guys always allowed in to pet the animals, or does she have connections? Terrific pictures, Lilly! I think I like the giraffe the best too. Your daugher is either completely crazy or completely brave... not sure which. :) But she IS beautful! WOW... amazing animals! Great photos! Yeah, I'll pass on the feeding, but love the photos! And your daughter is beautiful -- not that I expected less! The animals are beautiful and looked well cared for. Thanks as always for sharing the fun -- even from a distance! is this something new, you are self imposing? LOL surely not! Those are gorgeous animals. Your gorgeous daughter is brave. Here in the U.S., people are not allowed to feed zoo animals. In smaller zoos, there are designated petting areas where people are allowed, but never the carnivore kinds. I love that monkey! Thanks for sharing the pics. Great photos Lilly - having worked at a zoo for a while, I know ALL about the feeding part - not for the squeemish. Is that Taronga or Melbourne zoo? That monkey is too cute for words! Your weather looks a whole lot warmer than here. Great photos! I am in love with those white lion cubs. I would not have been able to handle feeding them other animal meat though. Given white lions are just about extinct now in the wild its not a bad thing that Zoos are trying to breed them. Many people do not know the great work that Zoos do. Circuses though are a different story. Your daughter is really lucky to have this experience and to see and feed all the different animals in one day. My hair looks like that monkey's on a daily basis! Dude, that monkey needs a blowdryer and fast. Great pictures. Love the appropriate Ghandi quote too! I love animals. thanks for these fun pics. There are so many aid groups helping people around the world maybe we need more animal groups. How thrilling... and scary... and I'm with you... I'll look from the fence.. .thank you very much! I need to get that monkeys hairdressers name! Yes, I did take all the photos on my blog, and I did all the page making too. Thanks for inquiring... it means a lot that you like them. 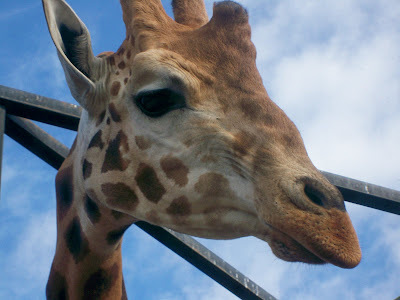 When my daughter was 3 or 4 we took her to the zoo and she wandered around, not really interested, till we got to the giraffes. I remember watching her eyes travel slowly up the legs, the body and that long, long neck, and she said, "Lookit them dragons!" From her angle, I imagine they did look like dragons. That looks like so darn much fun. Being an animal lover I would have thought I was in heaven! What a great experience for your daughter! ha ha. Great add on my blog. Short and to the point. Hello. Well, you are gorgeous so I know you don't NEED to post any ad anywhere. But I agree, it was so easy when we were young. But we were dumb. Are you saying that your mother is Irish? Get out. That must be an amazing experience. I visited the zoo but did not get the chance to get close to the animals like that. Youhad me with teh giraffe photo. Oh how I love them. Must be that gorgeous long, graceful neck. So Audrey hepburn. I myself have a fat, squat neck. Must be why I love them...pure envy! Ha! I do love that monkey's hair, I wonder what moose he uses? I would love to go on that tour. But then you know I'm a little on the wild side LOL. The monkey looks pretty cute, I wonder who did his hair, LOL. I bet your daughter enjoyed the tour. Yikes, I wouldn't want to get close to monkeys. They scare me. 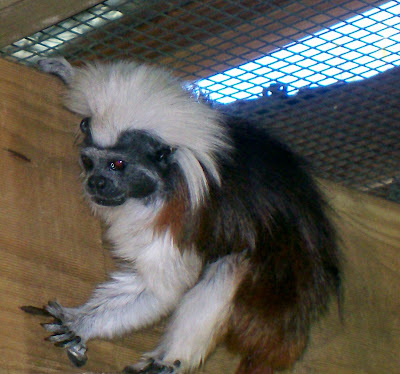 I saw that Malcolm in the Middle episode with the helper monkey and I won't be forgetting it any time soon! Oh, I would love to feed some mice and rats to someone, cause I HATE them. I probably would love to feed a monkey or two to the lions. How cool is your daugther! Oh my, your daughter is fearless… Thank you for sharing these beautiful animal pictures – I love em’ all!